Happy Birthday to me! 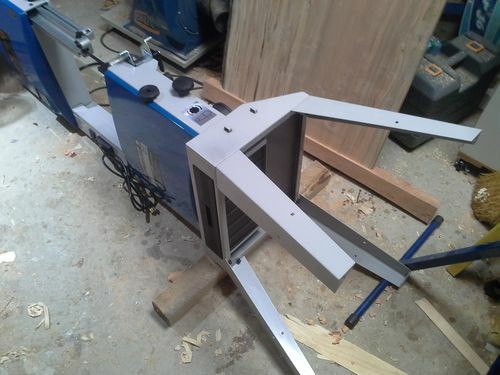 I have been eyeing this band saw since the beginning of summer. My band saw previous to this was a black and decker 3 wheel 10 inch which is ok for small stuff and not ok for anything else. 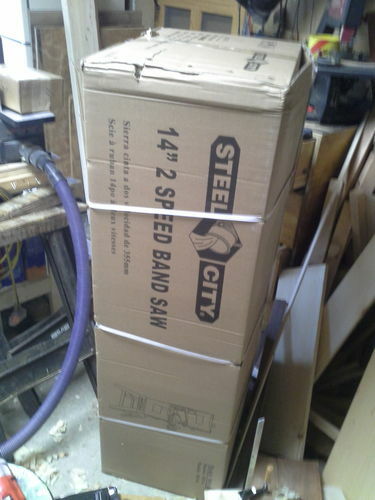 Anyway, after begging and pleading my wife (and finally agreeing to paint the house (grrrrrrrrrrrr)) I got a bandsaw. I got the saw yesterday and since I haven’t seen a review of this anywhere online (I looked everywhere) I decided to write in some quick thoughts to maybe help someone to decide one way or the other. The packaging it came in was a cardboard box with styrofoam to protect the saw. There was no damage to the saw or package when it came. All the necessary parts and hardware were present. So no trips to the hardware store, or customer service to deal with. 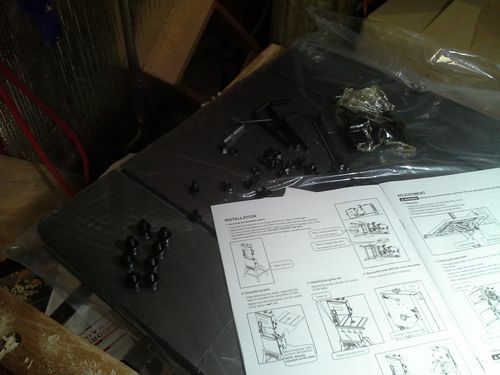 Putting it together was easy, there was only to put together the base and table. The legs on two of the cross members did not match up correctly with the screws that were supplied so it took a little wrangling, and a drill, to get them to line up. Only an extra couple of minutes of fuss however, nothing to get angry over. The manual says the saw weighs 160 pounds. I lifted it up myself, granted I have lifted swordfish bigger than this when I commercial fish in the summer, but I don’t think it it is too heavy. The saw is solid, it looks kind of like the Rikon, Craftsman etc. It is a solid steel frame with cast iron wheels. Has a quick de tensioning handle for the blade tension. A LED light that moves nice and easy and is very bright so you will definitely see what you are sawing. It has a large cast iron table (21” X 20”) or (51 to 53 cm). My favorite aspect is that it has a 12 inch resaw! Happy me. The supplied fence feels a little flimsy, but when it is locked down it doesn’t move. And worked well for what I tried on it so far. A 1 and 3/4 hp (manual says it draws 11.5 amps) motor powers the whole thing. I cut through some plywood which went easy, resawed some 6 inch pine which went easy too, and resawed a seven inch piece of oak that was 12 inches long and it went fine. I only used the supplied blade which cuts ok for me so far ( I have received 3 blades from buyfromawoodworker.com that will go on the saw soon which I am sure are much better). The blade length is 107 inches, odd size, but no matter. It has a three hole dust port for 4 inch, 2 and 1/2 inch, and 2 inch diamater dust collection. Otherwise it has a sawdust tray. I am very happy so far with the saw. The only negatives I can see is that the miter slots are odd sized and the base is something I may change as everything in my shop has casters to make it easier to move and clean. But on the whole I think it is a good saw for me as a hobbiest. Bear in mind I am not an experienced bandsaw user I am just giving my thoughts on what I think is a fine tool. 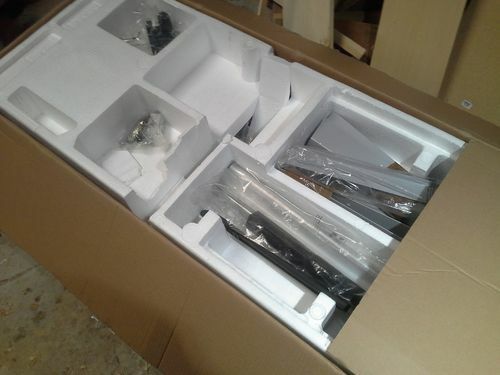 I ordered it from woodcraft and I paid $700 for the tool and $20 dollars for shipping. Came in about a week. Feel free to ask questions I will answer the best I can. Happy birthday Kaleb. Looks like a descent machine. I’ll try one of those blades you mentioned. The ones I get keep falling apart at the seam. I too am interested in your experience with this saw. Seems to be a good bargain – probably because it has been discontinued? Can you tell us which other saws you considered and why you picked this one? Happy Birthday, Kaleb!!!!!!!! Glad your saw is working so good. I’m sure you will saw miles of timber with it. It is so nice to have the 12” high capacity too right out of the box instead of having to install and riser. Congrats on your new saw. It is great to have 12’’ resaw capacity. You can cut up logs and have a huge stock of lumber in no time. Hi Jacquesr, I don’t think it has been discontinued. If you check woodcraft and type in the exact model that I have it will come up. It is marked as a new item. It is also on Home Depot, and Sears as well. I picked this saw because it was within my budget. The Rikon with the 12 inch resaw is 1000; as is the Jet. I could’ve added a riser block to a grizzly or something but that would have added cost and would have to put it together (I grant that it is not too hard) but the motor would have been smaller for what I was going for. The 17 inch band saw was out of my budget that grizzly has. The cost to me to get to my house was 719. Basically this saw was everything I was asking for with the money I had to work with. Hopefully that answers your question? Happy B Day and congratulations on your new acquisition. Having 12” resaw capacity is very nice. I dont see in on HD. Too bad, I save 20% when I buy anything there. Here Jacquesr try that. It is more expensive at home depot however. 2) With discounted gift card, I save an additional 10%, plus I will negotiate another 10%. Works every time. May it serve you well for years. I’ve been really happy with my Craftsman (Rikon) 12” bandsaw, and I wouldn’t spend $’s to get the 2 extra inches, but the 5 1/2 extra inches of resaw capacity—now that’s tempting. I don’t need it often, but I’ve had to cut some boards I didn’t want to to fit in the bandsaw. Wow! Sweet looking band saw. You deserve it. Can you tell us about blade change. How easy is it?